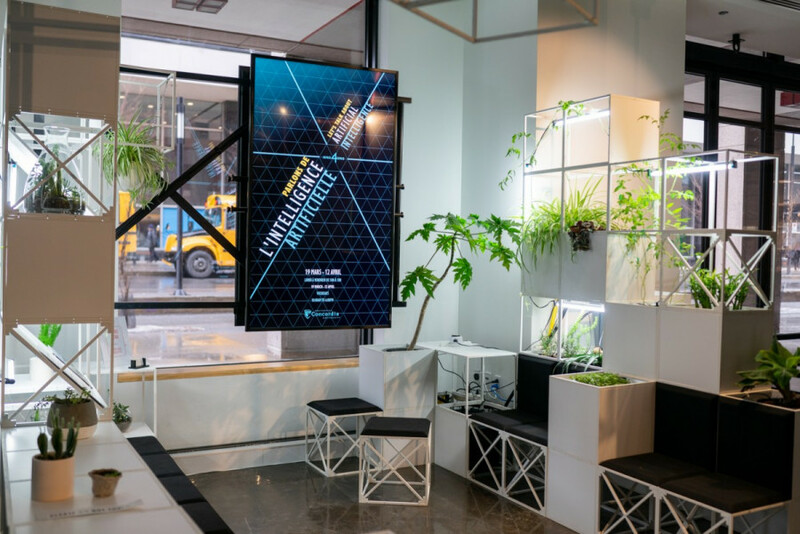 Perhaps you’ve already noticed it walking past Concordia’s 4th Space: the bright white cubes and shocks of green composing HydroFlora’s hydroponics display. HydroFlora is a working group of the Concordia Food Coalition. It’s owned by a group of social entrepreneurs and former students who say their business model is based on the desire to give back by promoting sustainable practices through education and community building. HydroFlora is a multi-faceted enterprise. The 4th Space display, near the corner of Maisonneuve Blvd. W and Mackay St., is far from their only presence on campus. Maybe you’ve noticed their pop up stand at Concordia’s farmer’s market. Or maybe you bought plants from them at their Valentine’s Day sale, or more recently at the semi-annual greenhouse sale. Maybe you attended one of their workshops on hydroponics. They are a visiting project based out of Concordia’s greenhouse, located on the thirteenth floor of the Hall building. HydroFlora planted its first roots in 2015 when Dominique Smith’s friend introduced him to the greenhouse. Though he’d been at Concordia for four years, it was the first time he’d ever been up there, and Smith liked what he saw. Smith noticed there were plants suspended in the air, soilless, which was his first encounter with hydroponics. As he got more involved at the greenhouse and began taking care of the plants, he felt as though he’d found his calling. He even said his grades starting slipping because he was so focused his newfound passion. With some help from individuals at the City Farm School and greenhouse, he registered Concordia’s first hydroponics club. But Smith wanted to go further to legitimize the organization, leading to HydroFlora becoming a working group of the Concordia Food Coalition. The other co-founders, Marian Thomas, Jerry Chen, and Clifford Pape, all bring unique and vital skill sets to the organization, making HydroFlora a successful marriage of left and right brain thinking. Thomas is responsible for the innovative hydroponic system designs, while Chen has a Master’s degree in plant physiology, making him a “plant doctor,” and Pape is in charge of the creative direction. In October 2016, Chen and Smith decided to collaborate on an idea: giving a hydroponics workshop. By 2017, HydroFlora had fully developed its educational arm and had plenty of practice giving workshops on hydroponics, sustainable practices, and urban agriculture to high schools, CEGEPs, and inside the greenhouse itself. 2017 is also when Pape joined the three other co-founders, completing the team’s expertise. “We were very scientific and we hosted a lot of workshops but we lacked any sense of what we were,” explained Smith. Pape is responsible for what would become one of the brands signatures: the concrete sneaker planters. His abilities are self taught. Pape messed around in the comfort of his apartment teaching himself how to work with concrete. The creation of the concrete planters necessitated a move towards further integration with the greenhouse, Smith explained, by helping them ease the transportation of their product. Hydroponics are a subset of farming in urban agriculture. Hydroponic systems are usually spatially efficient, making them ideal urban farming technology. Smith noted that they’ve done a lot of experimentation with various agricultural systems, learning through trial and error about what works and what doesn’t. “Every farm, every crop is different, you build it differently,” said Smith. HydroFlora has had a hydroponics display in the 4th Space since 2018. “Hydroponics is basically having a plant suspended in some kind of soilless medium as water passes through it. Some systems have water that sprays the roots through a mister, and that’s called aeroponics,” explained Smith. He observed that many people are familiar with the concept, since it’s often used to grow weed, but many aren’t aware of its other uses. HydroFlora offers consulting services and can create hydroponic installations inside a restaurant, for example. Those systems might not grow food, but they could improve a space’s air quality. 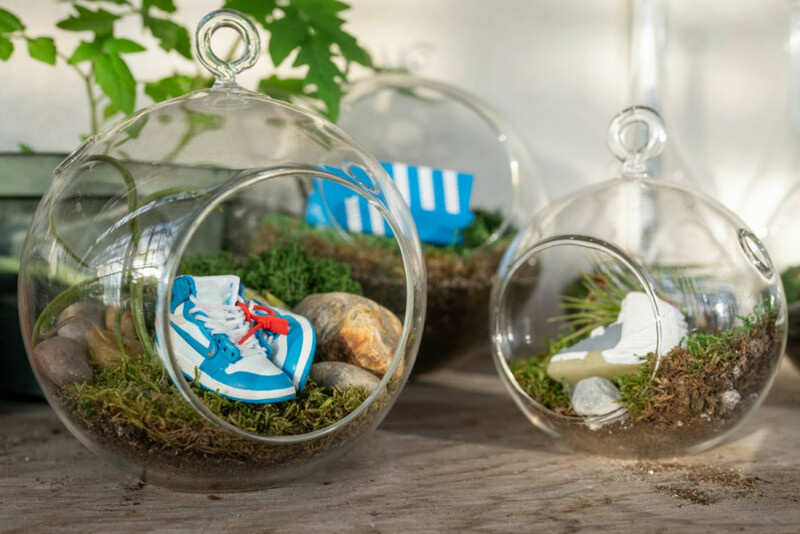 HydroFlora also sells plants ranging from $5 to $100, housed in concrete planters and distinctive terrariums, often accessorized with tiny reproductions of popular sneaker designs like the Nike Airforce 1’s. “I’m assuming that most people who do plants are a bit older and don’t necessarily make concrete sneaker pots,” said Pape. They have partnered with the Seguin Foundation to address the issue of deforestation in Haiti. The purchase of a HydroFlora plant could result in a tree being planted there. “We have a few different aspects to what we do. We have the cool creative stuff and the serious humanitarian side. They both work hand in hand with each other. The creative stuff, we try to find in popular culture to adapt to what we do and make our approach to plants interesting and different from what others are doing,” said Pape. Smith and Pape explained that HydroFlora has faced some criticism for referencing clearly corporate symbols in its products and working with Nike, who have been accused of labour violations. Lauren Fitzgerald’s pathway to becoming an intern at HydroFlora began when she found herself sitting in the greenhouse, wondering how she could finesse spending more time there. This led the urban planning student on an internet search, eventually leading her to HydroFlora. During her first semester she started attending their Sunday sessions, which sometimes include informal lessons relating to plants, open to the public, “A great resource if you’re willing to show up and learn,” she said. Fitzgerald kept returning even though there weren’t any open internships at the time. “The reason why I started coming consistently was because of how welcoming it was,” said Fitzgerald. She said she began her formal internship during her second term. Fitzgerald said that HydroFlora’s owners welcome people’s proposals and ideas. Fitzgerald’s idea to use sensors to check the pH balance, temperatures, and water pressure inside the hydroponics system, (increasing efficiency) is now being executed in HydroFlora’s 4th Space display by other members of the team. “I decided it would be necessary as HydroFlora experiences tons of clogging of the tubes and using sensors allows the team to do less manual checking,” explained Fitzgerald. She noted that the environment is positive and collaborative. The owners emphasise doing things you’re passionate about, understanding that it’s more likely to lead to a job well done said Fitzgerald. HydroFlora offers a wide range of concrete planters, terrariums, and ones that are uber-trendy, metallic, and geometrically shaped. They also have hanging planters made from old basketballs. Pape mentioned that many people ask about the significance of using runners. The idea behind it is to use sneaker culture, which he explained has become popular in the mainstream in recent years, to help sell their products and sustain their charitable goals. “It’s a way of bridging the gap. People who are sustainable don’t necessarily understand the aesthetic world and vice versa. People do things because of ease of access, that’s why people are wasteful,” said Smith. HydroFlora had a stand at the most recent SneakerCon in Toronto. “I don’t want to characterize all sneaker heads as being individualistic because there’s a big community approach behind that subculture, but there’s a lot of them that don’t know about the humanitarian aspect behind what we do,” said Pape. HydroFlora’s project in Haiti, launched in 2018, is an important aspect of the organization. “I thought me being from Haiti, it’s the poorest country in the western hemisphere, and it’s not that far from here. We could use the technical expertise to do positive work,” said Pape. According to Pape, two of the most pressing issues in Haiti are deforestation and a loss of arable land and heart disease. He noted that the latter is the number one killer in a country with an insecure food supply. Haiti’s forests were brutalized during colonial times for plantations, meaning that there are been little to no roots left in the ground, leading to soil erosion. When it rains, this leads to the good nutrients being washed away, because there are not enough roots to ground the nutrients in the soil. Shallow rooted crops do not hold nutrients the same way, explained Smith. By promoting urban agriculture and creating opportunities for education they are hoping to address the aforementioned issues. The Haiti project has multiple arms and one of them is a partnership with the research center GHESKIO, which has an elementary school on its campus. They worked to put together an urban farm, including an aquaponics system and vertical garden towers that provide the cafeteria with fresh produce and fish. Pape stressed that they do not consider themselves saviours of Haiti, but they are people who hoped to put their knowledge into positive use. The project is ongoing and there is a phase two plan in action said Pape. Several Haitian schools and one university have since reached out, interested in the educational aspect of partnering with HydroFlora. On April 12, HydroFlora will host a party in the greenhouse in conjunction with Nourish McGill. It touches on their goal of connecting the sustainable community and the general public. Smith observed that many parties promoting those themes don’t happen in actually sustainable spaces such as the greenhouse, making the issues feel more real. He said that it’s the only greenhouse open to the public in downtown Montreal and wants it to be a beneficial space for the whole community, not just Concordia. “It’s where that lady got her plant, it’s where you took that class and got your tan, it’s where you hang out every Sunday. It can’t be this exclusive box in the sky and I feel like that’s kind of what’s happened, so if we can make it more attainable, then that space itself can grow and get more funding,” Smith said.